NEW! oven mitts from MAGICAL DESIGN Having owned a Kitsch Supply company, we were always looking for oven mitts that provided serious protection from heat and burns. We know good oven mitts when we see them! High quality equals to high price? No! What you are buying today is excellent quality heat resistant oven mitt at an affordable price. MD oven mitts are from same production line as many other famous brand name oven mitt. we carefully manufacture, to provide you with more beautiful design and better cooking protection, which bring you pleasant cooking experience! We use 180gsm 100% cotton fabric , extremely soft lining and food grade silicone material.Our oven mitt is 7.9"x11.8"long with fashion design. It is heat resistant to 464F degree, design for non-slip grip,soft touch feeling and flexible for you to grab anything. We treat products quality as our life. We Strictly follow the sewing standard of 1-inch 8-9 stitches, and we promise every oven mitts undergoes 7 steps QC inspection before shipment;each batch of materials is tested for environmental protection;each design has been carefully selected, thus every customer can feel our wholeheartedly treat. MD Textiles has been in this line for over 10 years, has supply a lots of high quality products for world-wide brand-name, Has been pass Wal-Mart, BSCI, SEDX certificate. Choose MD means say good bye to high-priced low-quality gloves. We have been studying a large number of American kitchen decoration style, and most of people's use habits; carefully compared and selected the most classic design from more than 130 designs. Why not add our products to the shopping cart, we are able to bring you and your Family a pleasant cooking enjoyment! 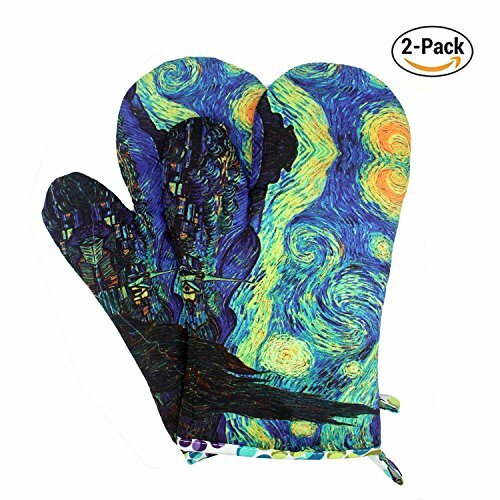 HEAT RESISTANCE TO 464°F: This oven mitt with special cotton lining not only is comfortable but also protect hands and forearms from hot dishes, pots and oven racks when cooking, baking or grilling. HIGH QUALITY: 100% Cotton Fabric, with a warm and nice touch. All materials are FDA approved and BPA free, safer in touching food. High quality cotton for maximum flexibility and maximum heat protection. SAFETY LENGTH: This oven mitt is 11.8 inch length, which is long enough to protect your hands and forearms. It also can keep your hands flexible when you wear them. WIDELY USED: Perfect for cooking, baking, serving, BBQ or dinner party. Great gift choice for Mother's day, birthday, college dorms, housewarming, hostess, new apartments. If you have any questions about this product by MAGICAL DESIGN, contact us by completing and submitting the form below. If you are looking for a specif part number, please include it with your message.